The gathered crowd stands by taking videos on their phones. Suddenly at 2:34 on the video an all American guy in a baseball hat, t-shirt and jeans, who has just crossed the street walks up, gently takes the irate Muslim's elbow, leans over and and says, "Shhhhh! There're families here. Go. Walk." The Muslim, who has more than met his match, cowers and backs away. He tries a few more rounds of weak half hearted shouting, but the American says, "Go. Walk. There are little kids here. Watch your mouth. Be quiet." When the shouting, yelling, screaming Muslim starts to argue back, the American towers over him and says, "Walk! I'm not joking, man." 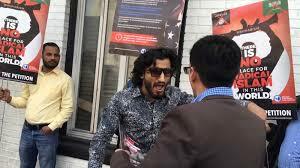 The Muslim stands and gets in the American's face, at least sort of because he's out powered here not only by brains but by muscle and height. The rampaging Muslim won't move so our hero pokes him in the stomach. A woman says, "Watch out. They're videoing this." The Muslim walks around the American telling the American not to touch him. Our hero replies, "That's fine. I'm not going to touch you anymore. Just watch your mouth. Watch your mouth." Note that our hero was concerned for families and small children witnessing this scene. Note how gently he brought down the irate Muslim. And finally note, that our hero "wasn't kidding, man" and that the Muslim KNEW that our hero would back up his words with muscle if necessary. However, it wasn't necessary because the Muslim, who thought that his shouting screaming and yelling were signs of power and might, was in reality a weak hopeless creature before our Christian hero who calmly did everything one handed while holding his phone.